Call or email for more information on ways you can become involved. Read below and email us with your area of interest. Retired teachers, stay at home moms/dads, or just have a love to teach, join us!! We have a variety of volunteer positions open from schoolmarm to 19th century demonstrations. It's easy to get started and we will provide a costume if you don't have one. The children are eager to learn with our hands-on program. Watch how their expressions change and curiosity grows as they learn about life in the 1800's. During the Spring, Summer and Fall months volunteers tend to the gardens by providing extra attention to the many flowers, plants, shrubbery around the village. This will include watering, mulching, weeding and landscaping. In return, our visitors enjoy the large and colorful blossoming rose gardens, scents of lavender and rosemary in the herb garden and the vibrant colors of Fall. so the outside elements and animals stay out. 10 and older can help, families welcome!! If you're a handyman or like to tinker, this is a great fit for you! Ongoing small maintenance projects like minor repairs to the inside and outside of buildings and ground enhancements. The Parks and Recreation Department mow the fields and larger areas while our volunteers use smaller mowers and gas powered trimmers for around the buildings and gardens. You and a board member will open the buildings one hour prior to wedding time, shuttle those needing assistance to and from front gate and church. Four hours maximum must be 18 years or older. Church rentals are a great resource to provide educational programs, building restoration and museum operations. re-enactor or interested in reenacting? Become a part of our events if you already have an 1800's Missourian based character or just getting started! 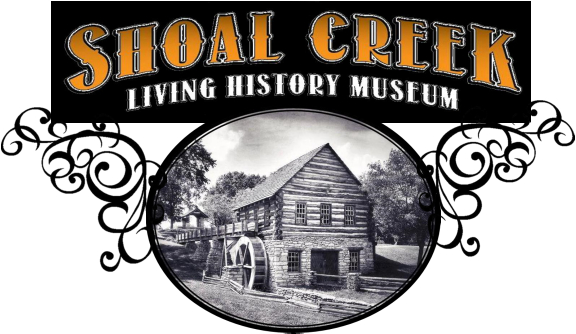 We want you to join us during our events at Shoal Creek Living History Museum. Scroll down and send us an email or call. Shoal Creek Volunteer Page.......Click HERE! To learn more about how you can volunteer, send us an email!